Ramadan is just around the corner and this is the perfect craft to get your little ones (and big ones) excited about it! 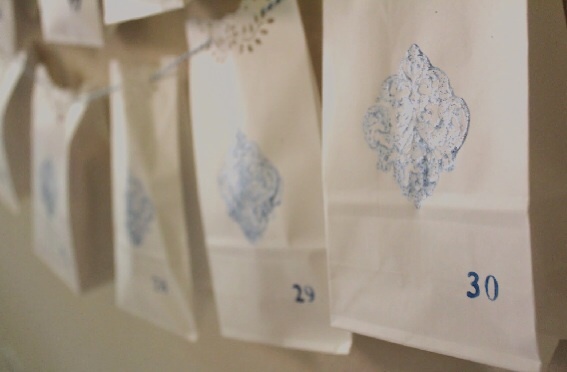 This Ramadan calendar has a special surprise in each bag, one for each day. Every night, at Iftar time, have your child open the bag to get a treat or a toy. This helps keep the excitement going the whole entire month! In some bags you can also put some Islamic inspiration. Write out a short verse from the Quran for them to memorize. Or give them an example of a Sunnah and have them follow it. For example, tell them it is Sunnah to smile or eat with the right hand and drink while sitting down. Ramadan is such a special and exciting time for Muslims and I love passing on that excitement to my children! May Allah make this a blessed month for us all, accept our good deeds and forgive our sins. Hello I just found you in pinterest today while looking for crafts to do with my son during Ramadan. I really want to make an advent calendar for him. I liked through so many. I’m not very crafty. But yours looks pretty abd easy which I like lol. But how come toy didn’t explain this one in detail like your other crafts. I would love to know how you mage thar pretty night backround. Like I said I’m craft challenged so I need step by step instructions. I would really appreciate it. Jazakullah and may Allah bless you. Hi Fatima, thanks so much! This was a lot of fun to do and not too hard. You can even involve your kids to help you paint it. I bought a thick poster board and painted the glittery dark blue background. Then I got a thin black poster paper and drew a masjid silhouette free hand and cut it out. I glued it on top of the poster board and decorated with the stars and moon. Then hung the paper bags with gifts. I would recommend using smaller bags and gifts, I felt the ones I used here were too big and so were the gifts and were a little annoying to hang because of the weight. It was my first year doing a ramadan advent calendar, so lesson learned! Hope that explains things, if you have any other questions, let me know!